Apart from making solid progress in a new fantasy novel for NaNoWriMo, I have another book-related development to share, this time not about writing but about reading. This gives me a good opportunity to share some thoughts on e-reading in general and about one e-reading platform in particular. If you look closely at the vendor-supplied image shown with this blog post, you may recognize it as a Kobo Glo HD, which is an e-ink reader with optional lighting. 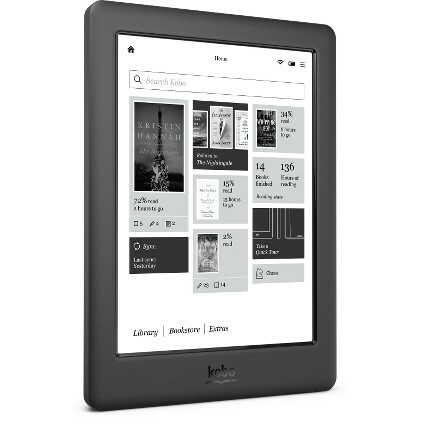 I've wanted an e-ink reader for years—originally I had my heart set on the Kindle that had a physical keyboard—and the Glo HD has been near the top of my list for months. And now? I have one on order! Read on for my thoughts on why I chose this device over others, and about the many available options for reading e-books. I've been reading e-books using a few different interfaces for several years now, so I didn't really need another reader. However, everything I used before was software installed on a computer or mobile device that could do a whole lot more than display e-books, and that was a problem. When you're reading a paperback, it doesn't chime to let you know that something has happened, like arrival of email. Reading an e-book on a computer or tablet, however, leaves the reader open to such disruptions unless a separate action is taken to block them. While it's possible to ignore those little alerts, I'm not very good at that. Presumably, a dedicated e-reader will give me about the same level of focus as a book in print. Another reason that I wanted an e-ink device in particular is so that I can read a book without having light shining directly in my face from the screen. The optional light for the Kobo Glo HD shines in from the edge and reflects back to the reader, reducing that "personal light pollution" that can disrupt sleep cycles, strain the eyes, and so forth. Plus, I can turn off the light entirely and it will be like looking at any other unlit thing (e.g., during the day or with room lights on). Since this is my first e-ink reader, I will have to wait until it arrives and I actually read on it to see just how much of a difference it makes. One device I considered, which would have cost the same before applying a discount, was the NOOK GlowLight Plus from Barnes & Noble. I suspect I might have actually liked the NOOK even better, but I specifically avoided buying it because I am very unhappy with the apparent attitude that B & N seems to have toward indie writers. They seem to view indie writers as a revenue source by selling products and services to them instead of selling books for them. If an indie author does well through them, they won't turn down the sales, but from what I have seen they don't seem to take indies seriously and thus don't make serious efforts to support them. (Yes, they have NOOK Press for self-publishing... which includes a print-on-demand service entirely lacking in serious features such as ISBN support and channel distribution!) I do believe that we influence the world around us with our purchasing actions, so by selecting the Kobo Glo HD over the GlowLight Plus I am "voting with my dollars" for a vendor that seems to treat indie authors like me more seriously. One of my concerns about buying a Kobo reader is that I'm really not fond of the Kobo store. Luckily, the reader should allow me to "sideload" books, which means I can acquire books from other sources and still read those books on my Kobo reader. However, I would really rather see substantial improvements in the Kobo "ecosystem" and that starts with having a good online store. As I mentioned above, I specifically chose a non-Kindle device to support a competitive marketplace, but that also requires competitive vendors. I'm not saying Kobo should copy Amazon, but I could certainly give them a list of ways to improve their online shopping experience. If you would like to share your e-reading choices, feel free to do so in the comments! Vendor-supplied image used with permission under editorial use restriction; no endorsement of this blog by the vendor is implied.